We are delighted to announce that the APPG on Infant Feeding and Inequalities is back! Following the snap 2017 General Election, the Group has been re-registered and an AGM held to elect new office bearers. The APPG is grateful to MPs from across the political parties for seeking election as office bearers, to the representatives of various organisations that attended the AGM, and to those who delivered presentations at the meeting – Shereen Fisher and Felicity Lambert from the Breastfeeding Network, Helen Crawley from First Steps Nutrition Trust and Francesca Entwhistle from the Unicef Babyfriendly Initiative. An inquiry into infant feeding policy has been launched by a parliamentary group of MPs in Westminster. 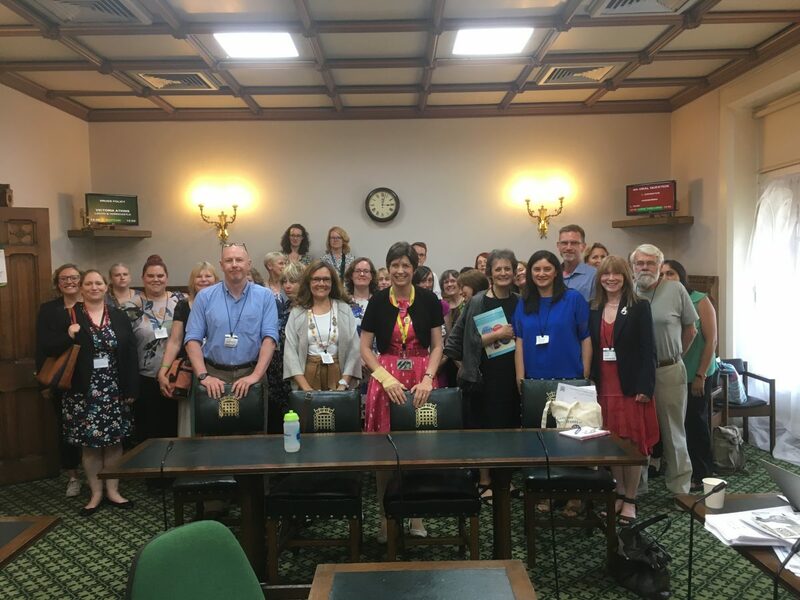 The All Party Parliamentary Group (APPG) on Infant Feeding & Inequalities today opened the call for evidence on its wide-ranging inquiry into infant feeding policy. As well as focussing on the challenges around bottle feeding, the inquiry will examine why the UK has the lowest breastfeeding rates in the world. The inquiry which, upon conclusion, will make recommendations to policy makers and Government also plans to hold oral evidence hearings in all four nations of the United Kingdom. “For too long, infant feeding policy has been at the bottom of Ministers and civil servants’ in trays. This was demonstrated recently when the Government’s obesity strategy didn’t even reference infant feeding, despite it being a factor in future health. “The UK has the lowest breastfeeding rates in the world, even though we know more mums would wish to breastfeed; there’s clearly an issue which needs to be addressed. In addition, feedback on my recent Formula Marketing Bill suggests there’s a real lack of impartial information and support available for those bottle feeding and I would welcome views on this. “With ever increasing cuts to budgets, it’s been suggested that peer support funding for breastfeeding has been disproportionately slashed, so we’re also keen to look into this more and identify the gaps in service provision. Equally, though, there are a number of groups out there – albeit under pressure – doing some really innovative things to try and support families and babies. The deadline for written submissions to the inquiry is 9am on Monday 12th June 2017. More information is available through the APPG’s website. A new Bill has been published today (Tuesday) which will tackle the “excessive and misleading marketing techniques” deployed by infant formula milk companies. The proposed law, which is due for second reading in Parliament later this week, has been welcomed by health professionals, parents and campaigning groups – including Unicef Baby Friendly. – Ban advertising of formula milks on TV, social media, the internet and through parenting clubs. “The Bill I have published today is a major step forward in tackling the excessive and misleading marketing techniques deployed by formula milk companies. “For too long, these enormously powerful multi-nationals have been pushing the boundaries and circumventing existing legislation to relentlessly promote their products to parents and families. The more we see new aggressive marketing techniques, the more we see ever higher prices for formula milk, which is borne by the consumer. “I absolutely understand and respect that some families will choose to use formula milk; this is absolutely not about breastfeeding versus bottle feeding. I want to make sure parents are protected from misleading advertising and can access impartial, trusted information when making feeding decisions for their children. The consultation I carried out demonstrated that many parents are making decisions based on marketing alone, which is deeply worrying. “There have been examples of products being recalled or discontinued after they make it to the shelves, for example for being found to have excessive protein. Other concerns include the introduction of prebiotics, which may not be necessary. Without an independent agency to test these products and verify the claims being made by companies, we have a situation of self-policing which simply isn’t working. “Under the current arrangement, formula companies are also banned from advertising formula milks for new babies but they simply get around this by branding their products almost identically, with packaging showing stages 1, 2, 3. “Follow-on” or “growing up” milks look the same as their baby milks, so parents are led to assume there is a progression. The reality is that there is generally no need for formula after the age of one. This loophole is costing families dear, with most formulas costing around £10 per packet. “For too long, formula companies have been running roughshod over the 2007 legislation which is no longer fit for purpose. In addition, the consumer has been picking up the cost for an ever increasing marketing war – this Bill will go some way to ending this and ensuring that parents are free from commercial influence and pressure when making choices about how they feed their children”. A Member of Parliament seeking to tighten up the law around advertising of formula milk has published the results of a recent consultation on her proposed Feeding Products for Babies & Children (Advertising & Promotion) Bill. 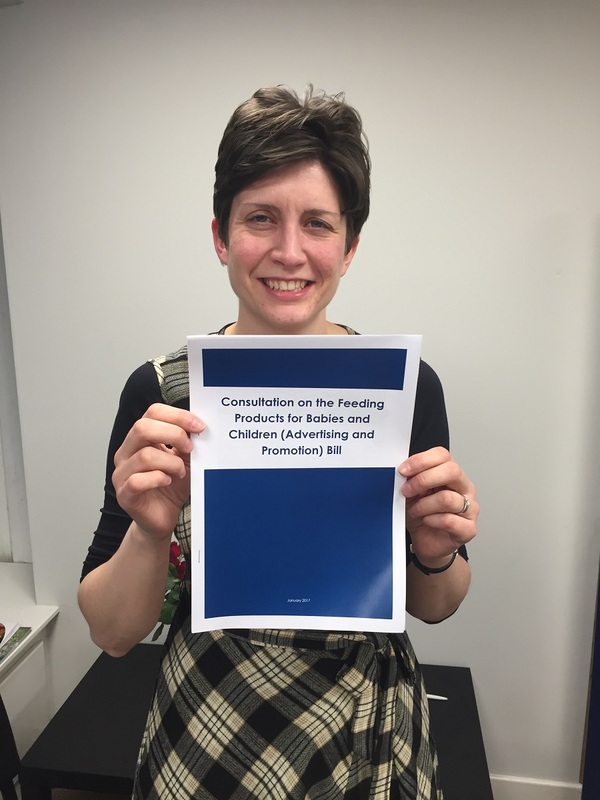 SNP MP Alison Thewliss was given unanimous approval by MPs in November to press ahead and draft a new law which would curtail the “excessive marketing techniques” employed by the formula industry. The Glasgow MP’s consultation ran from 5th December 2016 until 9th January 2017. She received 332 consultation responses, including from health professionals, parents and the representatives of the formula industry itself. “I am incredibly grateful to everyone who took the time to submit their thoughts and ideas around my proposed Bill. I was absolutely overwhelmed by the immense expertise and passion coming through in all of the responses. These have been invaluable in forming my thoughts on what to include in the Bill itself. “Understandably there have been a great many suggestions to include certain policies in the Bill, not all of which can be included in this particular piece of legislation. I want to make explicitly clear that this Bill is about making sure parents are equipped with impartial, trusted information to make informed choices about how and what they feed their children. “Tomorrow I will be meeting with parliamentary draftsmen to start writing the Bill, which will be published shortly. An MP campaigning to tighten up the law surrounding the marketing of formula milk has opened a consultation for consumers, campaigners and health professionals. Alison Thewliss, SNP MP for Glasgow Central, was recently given leave of the House of Commons to bring forward her Feeding Products for Babies and Children (Advertising and Promotion) Bill. Now the MP is asking interested parties to submit thoughts and proposals for consideration before 9am on Monday 9th January 2017. After that she will move to drafting the Bill, which will be published early in the new year. The Bill seeks to make provision for the control of advertising and promotion of feeding products for babies and children. The MP intends for the Bill to establish a body – completely independent of industry – which would regularly safety test formula milks and other infant feeding products, and potentially adjudicate on the veracity of claims made by companies as to the ingredients and nutritional value of such products. The Bill aims also to include provision for stiffer financial penalties for formula companies which publish scientifically inaccurate and misleading claims. Those interested in responding to the consultation are asked to fill out a short consultation form. “I have been overwhelmed by the support and good wishes of so many people who have a wealth of knowledge around infant feeding. I would encourage as many people as possible to visit my website, fill out the consultation form, and let me know their thoughts as to what might potentially be helpful to include in the Bill. A new law to tighten up advertising of formula milk has cleared its first Commons hurdle today. 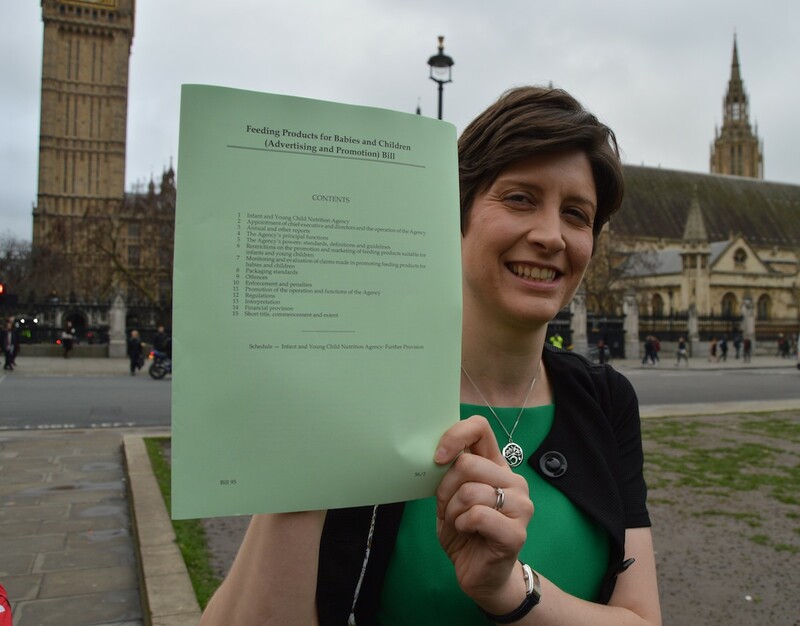 MPs gave their unanimous backing to SNP MP Alison Thewliss to push ahead with her Feeding Products for Babies and Children (Advertising and Promotion) Bill, which she says will “better support all parents in the infant feeding choices they make for their children”. The Scottish MP, who chairs Westminster’s All Party Parliamentary Group on Infant Feeding & Inequalities, has already secured cross-party support from MPs in the Conservatives and Labour as well as other parties in the UK Parliament. She will now take her Bill forward for second reading in Parliament in February. “Securing Parliamentary approval to introduce my Bill is a big step forward. I hope it will be the first step to give better support to all parents in the infant feeding choices they make for their children. “Whether parents decide to breastfeed or bottle feed is entirely a matter for them, and I very much respect the choices families make. This is not a debate about breastfeeding versus formula milk. “I believe it is vitally important that parents get accurate and impartial information on the contents of formula milk and the best way to prepare it safely. At present there is a worrying lack of independent scrutiny of infant and young child formula, as well as growing frustration about the industry marketing tricks and misleading claims being pushed on parents and health professionals alike. “Misinformation on health policy never ends well and this Bill aims to seriously tighten up the behaviour of the formula industry. A cross-party group of MPs at Westminster will today [Wednesday 16th November] start the legislative process to introduce a new law, which will tighten up the marketing of formula milks and other infant feeding products. 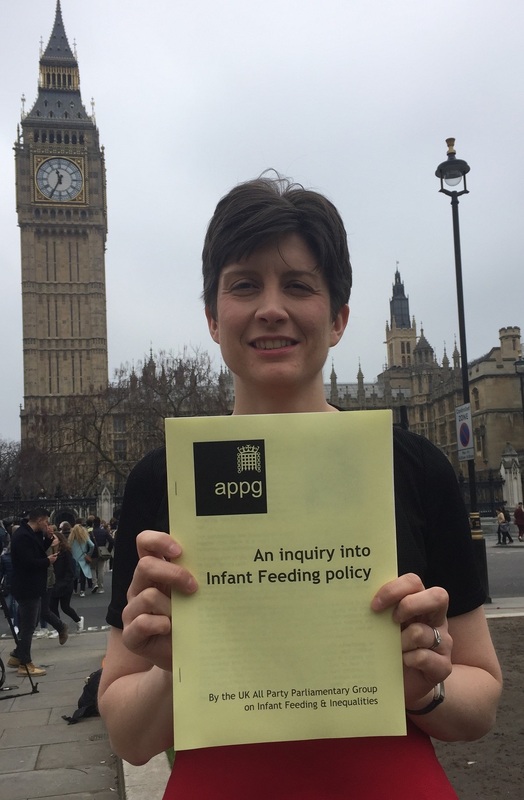 Alison Thewliss MP, who is chair of the APPG on Infant Feeding and Inequalities and is leading with the proposal, will today seek approval from the House of Commons to go ahead and draft the bill, making way for it to be given a second reading in Parliament. The legislative proposal has strong cross-party backing, including from influential Conservative MP and chair of the Commons Health Select Committee, Dr Sarah Wollaston. “I understand there is a genuine and sincere requirement for infant formula milk for mothers who can’t or indeed don’t wish to breastfeed, and any number of circumstances which lead parents and carers to choose formula. I come to this debate with absolutely no judgement or attempt to tell other parents how to feed their children. “I believe it is vitally important that parents get accurate information on the contents of formula milk, and the best way to prepare it safely. At present there is a worrying lack of independent scrutiny of infant and young child formula, as well as growing frustration about the industry marketing tricks and misleading claims being pushed on parents and health professionals alike. “Misinformation on health policy never ends well and I believe this requires an urgent change in the law, to seriously tighten up the behaviour of some companies. “Currently, a loophole allows for misleading and scientifically questionable claims to be printed in reputable and highly respected medical and nursing journals. This is an untenable position and the legislation I am proposing will tackle this issue head on. “My bill would also mean that the UK fully implements the international Code of Marketing of Breastmilk Substitutes, which has been called for in numerous reports.